Is there anything sweeter than a child is at Christmas? Not even the candy canes that people gobble down this time of year can compete. Did you know that good dental health begins even before children get their two front teeth? According to the American Dental Association, caregivers should clean their babies’ teeth with a warm cloth to discourage excessive bacterial growth on the gums. The cloth will also feel good to a baby’s sore gums while baby teeth get closer to erupting. Once babies get their first teeth, they need to have their first dental exams within six months. Now is the time to begin brushing as well. Use a baby or toddler toothbrush with soft bristles. Don’t brush right after a meal either, as that’s when the enamel is softest and more susceptible to damage. Don’t use toothpaste with fluoride in children younger than 3 – buy a training toothpaste for babies, which doesn’t contain fluoride. A pea-size amount is plenty. Sugar hides everywhere, not just in obvious places like sodas and candy. Gummy vitamins, milk, and even 100% fruit juice contain enough sugar to contribute to high levels of tooth decay in your child’s baby (or primary) teeth. Cavities and fillings are common in children. Try these tips. They’ll help you prevent tooth decay and keep your child smiling all year round. Don’t put baby to bed with a bottle/sippy cup. Babies younger than 12 months lack the motor skills to push away their bottle, so the juice or milk sits in contact with their teeth, which can lead to baby bottle mouth. Don’t share utensils or cups, and don’t pass food from an adult’s mouth to a baby’s mouth. Adults have a much higher bacteria count in their saliva and can pass those germs to the baby. Introduce teeth-friendly foods early. Apples, pears, and carrots all have ingredients that protect baby’s delicate enamel. Letting babies try these foods early will encourage them to make healthy decisions as they grow older. Stay current with dental checkups. Your child’s dentist is your greatest resource to keep your tot’s mouth healthy. Make sure they see your child twice a year. After the holiday hustle and bustle is over is a great time to schedule a visit. 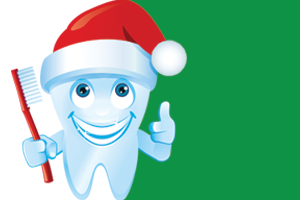 Follow these tips to help keep your child’s smile merry and bright!